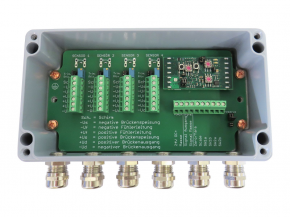 The measuring amplifier GSV-15HSW has two Schwellwertausgänge, which can be set via coding in 10% increments. With the "Scale" function, any input size in the range between 0.2 mV / V to 3.5 mV / V are scaled to an analog output voltage of 10V or 20mA. Junction box with measuring amplifier for sensors with straingages. Analogue output ±10 Volt and 4...20 mA configurable.